Very good quality, bright colors. Soft feel! I wouldn't hesitate to order from Overstock again if I had the chance. Bold and bright, the Mi Zone Tamil Coverlet Set can revitalize the look of your bedroom. An updated paisley pattern is vibrantly showcased with an eclectic mix of floral prints and medallions, while matching sham(s) harmonize with the colorful pattern seen on top of the bed. Made from ultra-soft microfiber, this bedding set is exceptionally soft to the touch and machine washable for easy care. A decorative pillow that features embroidered details fashionably completes this fun coverlet set. I will be honest - my expectations weren't too high. I was expecting a cute quilt set that might work as a blanket on top of my existing bedding, but something not too terribly great in regards to quality. Boy was I wrong! This quilt set is phenomenal! The quality is so far above any other bedding item I've owned, and even the items that were four times this price. The material is satiny soft and I can even use the shams for my personal pillow, they are that soft! Normally I throw the shams onto the floor at night and can't stand to feel them touch me, but this material is absolutely amazing. The quilt is also incredibly warm and something I was not expecting in the slightest due to its lightweight. The colors are rich and saturated - the only difference with the colors portrayed online and in real life? The color that appears green in the picture is actually more golden. I purchased a Queen size and it is perfect. There is more than enough quilt to hang off each side and the foot of the bed as well. The shams are the perfect size for your regular pillow that you sleep on (standard size. Not king sized shams). I'm SO INCREDIBLY happy with this purchase and will 100% be buying this brand in the future. This quilt was so comfy and soft I LOVED it. Too bad it wasn't long enough on the sides for my bed, I have a queen with a 2 inch foam topper, and it was way too short. They don't sell it in a King size and if they did ,the shams would be huge for my queen pillows, and I would have to buy king size and they would be too big. 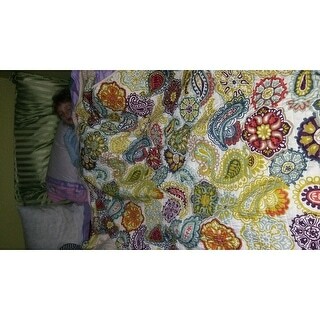 I'm really bummed out because this was the softest quilt ever, and the colors beautiful . Not wide or long enough. Have trouble keeping it on bed. This quilt set is very nice and matches my fifty year old chartruse curtains very well, but the colors are not well represented by the photo. In the photo I see a better balance of color--re/orange, blues and purple and not even all that much in the green tones. In my bedroom (perhaps the curtains make the green pop out) the quilt and sham seem too green. Had I seen this product in real life before purchasing it on sale I wouldn't have bought it, though that's not because it is poor quality. It just isn't quite the color I'd hoped. Also, I wish quilts were made in seprate sizes for full and queen sixed beds. My full sized bed is nicely covered, but the corners at the foot of the bed occasionally trip me or my husband because they hang three or four inches below floor length. For the price, this is an excellent value. The little decorative pillow is surprisingly useful, for as a side sleeper I sometimes need a pillow between my knees to keep my hips aligned to prevent pain. This little pillow is cute and doesn't get in anybody's way under the covers. Love this quilt! This quilt is so super soft and the quality is much higher than usually found in quilts at this price. It is a lightweight quilt which works great for warm months. I use a down blanket underneath when the weather is colder. The only reason for not giving it 5 stars is the size. It is not over generous. I have a queen bed with a thick pillowtop mattress and it just barely covers it. After reading this in other reviews, I was disappointed that it was not available in a king size which I would have liked. However, the reviews were so good regarding the quality and softness of the quilt and the colors so I ordered it. Love the way it looks and feels. Really brightens up a room! I don't normally write reviews but I was so please with this set that I simply has to give it a review. I have had the set for several months and I have pets so it has been washed several times as you can imagine. This quilt looks as good today (it's in the dryer right now) as it did the day I purchased it. I am very pleased with this purchase and would certainly recommend to friends. Beautiful, light weight quilt and pillow shams. I am so very happy with my quilt and pillow shams. Superior, quality made bedding, very soft, not cheaply made at all. I bought a Queen size, and there's plenty to hang on both sides of my bed. It is just perfect. The pillow shams are a perfect fit on my standard size pillows, and I actually use the pillows to sleep with! They are THAT soft and comfy. I am very hot natured, so I use my quilt set year round, sometimes with a light blanket underneath in the coldest of winter months. The colors are beautiful and vivid. This quilt has held up through many washings and STILL looks amazing! It has kept it's colors without bleeding or fading, and held it's shape very well. I would not hesitate to purchase again. I highly recommend this bedding set. You will NOT be disappointed! I had been shopping for a light quilt for quite some time - I wanted the right colors and pattern to match and spruce up my bedroom, decent quality, and the right weight for spring and summer. We've had this for a couple months now. The colors are just right for our bedroom (dark brown accent walls and light green walls and ceiling) - it was nice finding something with browns that didn't have too much blue. The fabric is really soft, and so far our cat (not declawed) has not caused any snags in the fabric. Based on other reviews, I made sure to measure our old quilt and compare to the dimensions of this one (we have a queen bed). The quilt doesn't fall all the way to the floor, so if that's an issue you may need to get a bed skirt. The pillow shams work with standard sized pillows, and are really pretty as well. I use the tiny accent pillow on a chair instead of the bed, and it is a nice way to tie it all together. I haven't had to launder it yet, so I can't speak to its overall durability, but overall I am very happy with this purchase so far. I would actually give it 4.5 stars but I don't have that option so I went conservative with 4. The colors are as vibrant in person! The colors in this quilt set are as vibrant in person. The fabric is soft and looks as if it will hold up for a long time. This quilt is more like a coverlet, the colors are bright, it is very soft, and well made. This quilt is beautiful,the colors are vivid.The picture does not do this justice.This will brighten up your bedroom. This set is so vibrant and fresh! I smile every time I walk in to my room. The colors are bright and beautiful, and the quality of the quilt itself is great. The photo shows a kind of lime green color, but in person it is actually a little more golden/pea green, but I really like it better. Definitely a great purchase! Nice quality quilt and shams but was a bit disappointed with the colors. I ordered this quilt because I thought portions of the color in the flowers looked like it was burgandy, cranberry or maroon. Actually it is a rusty brown color and that was a bummer. I kept it though because the pattern is cute and I'll make it work. I liked this item much better than I expected to. On my monitor, the colors looked more neon, but in reality it has a lot of green/gold that is avocado-ish in color. Still bright and vivid but more sophisticated. Kind of a retro vibe. Very soft. Not a thick quilt, more like a bedspread or coverlet, so it is not very warm if that's what you are looking for. In the winter I will probably pair it with a solid color blanket underneath. 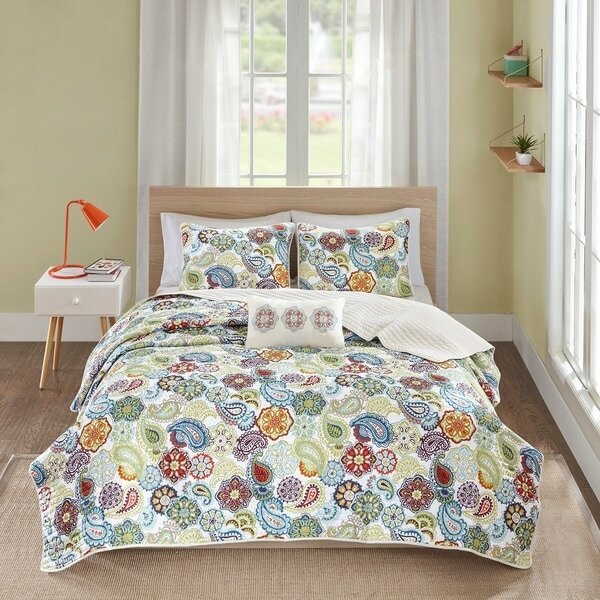 This quilt set really brightens up a room! The quilt set is really beautiful and colorful. I love the floral/paisley print. The colors are bright and intense, and can look good with a variety of wall/rug/sheet colors -- green, blue, lavender, purple are all in the quilt and would all look great with this bedding. The quilt is lightweight, but warm enough. The shams fit well, and the accent pillow is very cute. It looks fresh and modern but a little traditional at the same time. The quality seems to be very good as well. Bought 2 twin sets for a guest room and couldn't be more pleased. The colors are vibrant and rich. I will 'dress' the beds so the quilt will be folded to show 1/3 of the colors; with the reverse side a crisp off white color it will be perfect. Sets appearto be well made, decorative pillow is a bonus. Very pleased. Totally love the colors. Did not fade. The fabric almost has a flannel feel. The size is true and the shams fit well. I would recommend this purchase. The colors in the quilt are very bright and inviting. The quilt has a nice softness to it. This quilt will make any room light, bright, and airy! Great looking quilt well made . Goes with many things. Very colorful and lightweight, soft material, well made and perfect fit. Just what I was looking for to lighten darkly painted room. Would recommend! This is a beautiful set that has held up to repeated washing and drying. The colors have remained vibrant. Love this set! Loved this set, absolutely beautiful. Purchased this for my girls bunkbeds one twin set and one full set. I love this Quilt set. High quality material. Looks beautiful on our guest room. highly recommend it. This is such a Colorful Set! We use it year round!!! Fits true to size! "Is the background bright white or off white? It looks like the face is bright white, but the back looks like off white - is that correct?" "What is included with this set?" "What are people using for a dust ruffle with this set? I have to be able to cover my box spring." I actually have a dark brown skirt covering my box spring that I use with my winter bedding. And when I put this coverlet on, to my surprise, it looked great! It just made the colors pop! "Can I order just one twin pillow sham? We lost ours and I need to replace it." "What type of material is this quilt made of? Is it cotton?" This set is constructed of microfiber. "Me again! Is this quilt available in a king size? Will you be getting more in stock? It looks from the description that it does come in a king size." At this time, we do not have an estimated restock date set. Yes, I bought it in the king size. However I wanted it for a queen-size bed--my reason was that I wanted the quilt to fall below the bed rails. It worked as I hoped it would. The set is very cheerful and colorful. I then ordered the shower curtain to go with the set. "I have a chocolate brown bedskirt and curtains-would these colors in the coverlet blend with that?" We try our best to represent products accurately, however, due to differences in displays and the subjective nature of colors, shade may vary slightly. Hello! I also have Chocolate brown bed skirt and valances in chocolate brown. This bedding looks really nice with it! I purchased this bed set just a little while back and I love it!